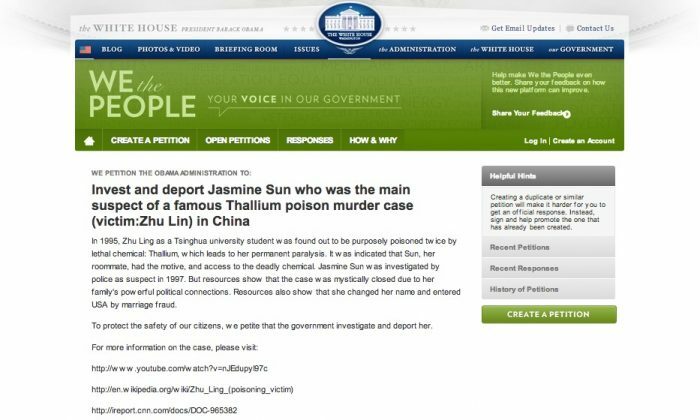 An unsolved Beijing poisoning case with all the trappings of a murder-mystery thriller has entered the international arena via the Obama administration’s “We the People” petition platform. The plot involves former students of Tsinghua University, a suspect with high-powered connections in the Communist Party, a possible cover-up including an identity change and illegal entry to the United States, massive censorship of the Chinese blogosphere, and a few celebrities thrown in for good measure. Except the victim didn’t die. In 1995, budding chemistry student Zhu Ling was hospitalized with odd symptoms: She felt sick and all her hair had fallen out, but doctors were at a loss to explain why, as reported by U.S. magazine New Republic. Zhu’s friend, Bei Zhicheng, put out an online plea for help to hospitals and universities overseas, listing her symptoms and test results. Responses quickly poured in saying that she needed treatment with Prussian Blue, an antidote for heavy metal poisoning. The antidote worked, and Zhu began to recover. However, the poison had already damaged her brain, and she was left blind and paralyzed; she is now 40 years old, in the care of her septuagenarian parents. Zhu’s roommate, Sun Wei or Jasmine Sun, was widely suspected as the poisoner, but Beijing police cleared her name following a four-year investigation, saying conviction was impossible due to deterioration of forensic evidence. It turns out Sun’s grandfather, Sun Yueqi, was a senior official in the Kuomintang, and close to the father of former Party leader Jiang Zemin. Her uncle, Sun Fuling, was ex-deputy mayor of Beijing and vice chairman of the Chinese People’s Political Consultative Conference, a high-level advisory body to the Communist Party. Sun is rumored to have changed her name to Sun Shi Yan, and escaped to the United States by marriage fraud. Zhu Ling’s case was brought into the spotlight recently after a university poisoning incident at Shanghai’s Fudan University last month, involving a promising medical student believed to have been killed by his roommate using a rare research chemical in the dorm’s water dispenser. Undeterred, Chinese again sought online help overseas, this time exercising the First Amendment. A White House online petition started on Friday has already attracted over 115,000 signatures, meaning President Obama’s office now has to provide an official response. New York-based Chinese lawyer Hai Ming told the state-run China Daily that President Obama cannot deport anyone, and any investigation would have to be made by U.S. Citizenship and Immigration Services. The commentary was promptly deleted, however, emphasizing the political sensitivity of the case—even mouthpiece media misstepped.